Bunge y Born was founded in 1818 by Johann Peter Gotlieb Bunge in Amsterdam, it was relocated to Antwerp by Edouard Bounge in 1859. Edouard's brother; Ernest Bunge, took the Bunge name to Argentina in 1884, and in 1905 the business extended to Brazil and later on to the United States. The company was converted into the Bermuda-registered Bunge International in 1994, retaining the Bunge y Born name only in Argentina. Bunge remained a privately held company of 180 shareholders (including the longtime controlling family interests) and divested itself in 1998 of almost all its retail foods interests in favor of a greater role in international agribusiness and commodity markets; by then the company's gross annual turnover had reached US$13 billion. Bunge ultimately went public on the New York Stock Exchange in 2001, becoming Bunge Limited. 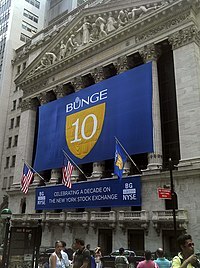 The New York Stock Exchange on August 4, 2011, when Bunge celebrated the 10th anniversary of its listing on the exchange. In 2001, under the leadership of Alberto Weisser, Bunge was listed on the New York Stock Exchange. Through their three businesses—agribusiness, fertilizer, and food products—they have established a leading global presence in the farm-to-consumer food chain. Bunge is the world's largest oilseed processor, the world's number one seller of bottled vegetable oil to consumers and the largest producer and supplier of fertilizers to farmers in South America. In 2004, Bunge acquired Cereol, parent of oilseed companies Central Soya and CanAmera Foods. In 2008, Bunge acquired Walter Rau, a margarine company, from Germany. In 2009, Bunge acquired the margarine business from Raisio Group, maker of functional food ingredients. In 2017, Bunge announced intentions to acquire a 70% stake in IOI Loders Croklaan for $946 million from Malaysian palm oil producer IOI Corp Berhad. In 2012, Bunge came under criticism from NGO Survival International for sourcing its sugarcane from the ancestral land of the Guaraní people in Brazil. It has been reported by the tribe that crop production has brought pesticides and machinery that has damaged their health, as well as restricting them to a small area that has prevented them from hunting and practicing their traditions. Also, in January 2003, opposition from the tribe had led to the killing of their chief Marcus Vernon by ranchers. In 2012, survivors were requesting Bunge follows the example of the company Raízen, which agreed to stop the sourcing of sugarcane from the area. In May 2017, Glencore in Switzerland began pursuing the acquisition of Bunge. In early June 2017, Bunge hired advisers to help it fend off Glencore's takeover interest. In January 2017, Archer Daniels Midland agreed to sell its crop risk services (insurance) unit to Validus Holdings for $127.5 million. On January 19, 2018, it was reported that Archer Daniels Midland had approached Bunge Ltd. about a takeover, with details "unclear." At that point, Bunge had a market value of about $9.8 billion, and was still being pursued by Glencore. In 2006, the United States Environmental Protection Agency filed charges against Bunge company regarding pollution emissions. This involved twelve soybean processing plants and corn mills in eight states throughout the US. The lawsuit claimed Bunge violated the Clean Air Act by constructing major modifications that increased emissions. Bunge was required to implement engineering changes and pollution control projects, estimated to cost $12 million, to reduce emissions at the facilities by 2,200 tons a year. The settlement also called for Bunge to pay a cash penalty of $625,000 and to spend $1.25 million to fund community-based environmental projects selected by and to be supervised by the impacted states. The state of Kansas will receive $22,000 of the $625,000 civil penalty, this being issued by the Kansas Department of Health and Environment. ^ a b c "Agribusiness - Food Production Company - Bunge". bunge.com. ^ "Bunge Limited, a company incorporated under the laws of Bermuda ( for Bunge (BG)". wikinvest.com. ^ Talati, Sonia (September 17, 2016). "UBS: New Boss, New Mission". Barron's. ^ "Bunge Limited to Acquire Ft. Wayne's Central Soya". insideindianabusiness.com. Archived from the original on 2013-09-07. ^ FoodNavigator.com. "Bunge acquires controlling stake of German oil supplier Walter Rau". FoodNavigator.com. Retrieved 2017-09-12. ^ "Bunge to buy 70 percent stake in IOI Corp unit for $946 million". Reuters. 2017-09-12. Retrieved 2017-09-12. ^ Survival International. "US food giant accused over biofuel 'tainted with Indian blood'". survivalinternational.org. ^ Ryan Villarreal (8 December 2012). "Deadly Ethanol: Brazil's Sugarcane Farms Take Toll On Indigenous People". International Business Times. ^ Survival International. "Shell scraps controversial biofuels plan after Brazilian Indian protest". survivalinternational.org. ^ a b Bunge, Jacob; Mattioli, Dana (January 19, 2018). "ADM Has Made Takeover Approach to Bunge Ltd". The Wall Street Journal. The New York Times, New York City, United States. Retrieved January 21, 2018. ^ Hume, Neil; Fontanella-Khan, James (June 4, 2017). "Bunge hires JPMorgan and Shearman & Sterling in Glencore defence". Financial Times. United Kingdom. Retrieved June 5, 2017. ^ "Bunge North America Inc". lawyersandsettlements.com. ^ "10/26/2006: $13.9 Million Clean Air Act Settlement with Multinational Soybean and Corn Processor Secures Major Pollution Reductions in Eight States - Settlement Expected to Eliminate More than 2,200 Tons of Harmful Emissions Annually". epa.gov. ^ "Bunge Management Team". bunge.com. Retrieved 2015-11-05. This page was last edited on 7 November 2018, at 07:40 (UTC).